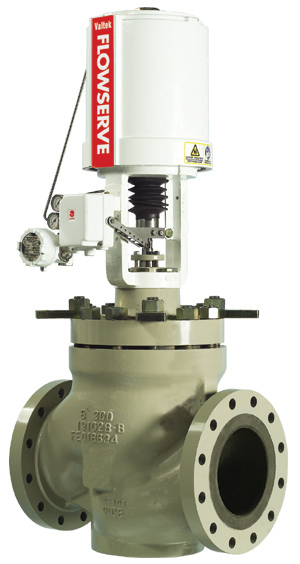 The Flowserve Valtek Mark 100 control valve is a large control valve designed to have the features needed by large applications. The Mark 100 globe control offers the highest flow capacity, as well as fast, easy maintenance in both gas and liquid control. The Mark 100 also has longer stroke lengths and finer control resulting in superior process control and smaller valve sizes. Mark 100 is available in sizes 6” through 16” and 150 to 300# class. With a clamped-in seat ring, the Mark 100 has been designed for easy maintenance and flexibility. The seat retainer (cage) in the Mark 100 can be changed out to provide an exceptional variety of severe service options, including MegaStream, CavControl, ChannelStream and TigerTooth. The spring-cylinder actuated Mark 100 valve provides stiffness and maintains high positioning accuracy, repeatability, controlled high speed, and faithful response. The Mark 100 valve handles up to 150 psig (10.3 barg) supply air and has the thrust to shut off against much higher fluid pressures. The Mark 100 control valve is the industry choice for large, simple, reliable and tough globe valves.